The cedar of Lebanon is a huge evergreen tree by Middle Eastern standards, reaching 90 feet in height, the “King" of all biblical trees. The wood is astonishingly decay-resistant and it is never eaten by insect larvae. It is beautifully majestic and red-toned with deep green leaves. The tree bark is dark gray and exudes a gumlike resin from which the highly aromatic oils are produced. Cedar of Lebanon is the strong, fragrant wood used to build David's house, Solomon's house and much of the First Temple. It was also used along with hyssop in the cleansing of a leper's house. It speaks of strength, permanence, wholeness and restoration. Ps 92:12 "The righteous shall flourish like the palm tree: he shall grow like a cedar in Lebanon." We have made available for purchase our 8 oz Cedars of Lebanon Oil in a separate plastic amber container, which may be poured into any one of our beautiful oil holders. 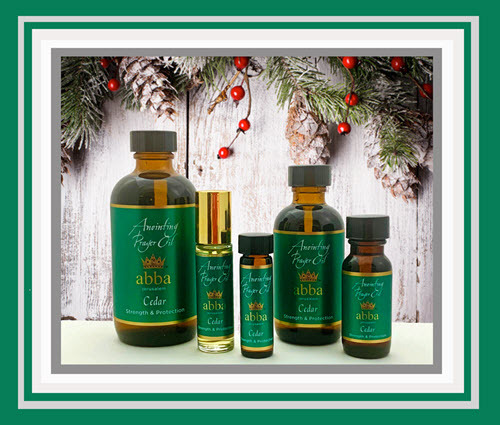 Abba's Cedars of Lebanon anointing oil is a unique blend of pure olive oil from Israel with an essential oil base of Cedar.